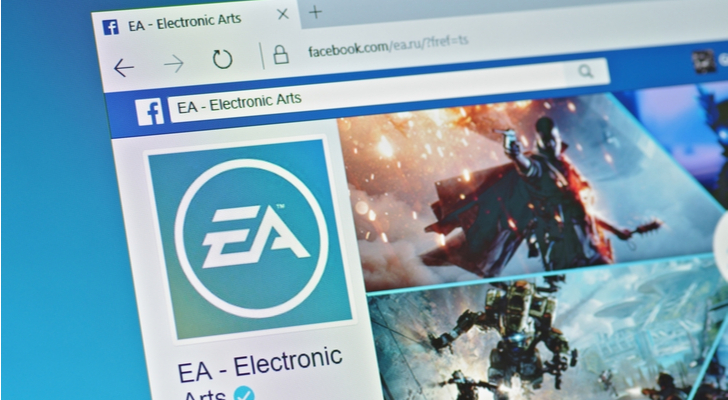 It only took Electronic Arts (NASDAQ:EA) stock two days to recover from its post-earnings swoon. EA stock spiked higher in Friday trading on the initial success of its battle royale game, Apex Legends. Thanks in large part to this success, Electronic Arts stock can continue an accelerated march higher as investors judge EA for its long-term growth story rather than for its short-term woes. EA spiked higher by 16% on Friday following the report on its latest game release. Apex Legends had already attracted 10 million just 72 hours into its release. This free-to-play battle-royale game outperformed the release Fortnite, the smash-hit game from Epic Games. Apex Legends still has a long way to go before catching up to the 200 million person user base of Fortnite. But Fortnite finally has a viable competitor. This capped off a crazy week for Electronic Arts stock. EA plunged by more than 13% in Wednesday trading. The gaming company released earnings the previous afternoon. Though the company beat earnings estimates, revenues fell short of Wall Street expectations. Moreover, lackluster sales of FIFA 19 and Battlefield V and lower sales guidance also weighed on the stock. However, due to the news on Apex Legends, EA stock still marched 7% higher in the first week in February. The surge continued Monday as the stock rose by almost 8% in morning trading. Now as EA stock price exceeds $105 per share, can it continue moving higher? Long-term investors in Electronic Arts stock would probably prefer to forget fiscal 2019. The most recent earnings report showing the lowered guidance and stagnant profit growth seemed to represent its short-term woes. I even urged investors to stay away as the herd continued to push Electronic Arts stock down. The stock would go on to lose more than half of its value before a recovery began. Even with the recent upward moves, EA stock still trades 30% lower price than its 52-week high from last summer. Thankfully for bulls, this fiscal year ends on March 31st. Also, bulls can take solace in EA’s performance compared to its key peers. Activision Blizzard (NASDAQ:ATVI) and Take-Two Interactive (NASDAQ:TTWO) also took hits following earnings. However, both ATVI and TTWO have fallen since January 2nd. Electronic Arts stock has risen by more than 26% year-to-date. Moreover, Electronic Arts stock appears ready to move past the tepid growth it saw in 2019. Analyst project 11.9% profit growth for the upcoming fiscal year. They also believe the double-digit profit growth will continue in the years beyond. Also, at a forward P/E ratio of around 20, it has not yet become expensive. Admittedly, with the massive increase since the beginning of 2019, Electronic Arts stock could pull back modestly. However, if that happens, that move will likely be short term. Despite this possibility, I still see EA stock as the stock to own in this sector. The firm holds other popular franchises such as Madden and Star Wars. Now, with its foothold in the battle royale niche, the company can more easily meet or exceed projections. Further, with ATVI and TTWO expected to see slower growth, gaming investors will more likely move towards EA. Thanks in large part to Apex Legends, investors again see Electronic Arts stock for its long-term growth story. Last October, I described EA stock as a solid equity that investors should avoid as traders bid its value down. With its move higher since Christmas week, the mood on EA stock has now shifted. Even with the possibility of a near-term pullback, I think investors should shift too and buy EA. While the recent earnings report discouraged investors, it became a temporary setback in a long-term growth story. Given its comparable forward P/E ratio and higher growth rates, I see EA as the stock to own in this sector. With its initial success in Apex Legends, Electronic Arts stock is back in the game. Gaming investors should get in too as it marches back toward its all-time high. Article printed from InvestorPlace Media, https://investorplace.com/2019/02/thanks-apex-electronic-arts-stock-back/.